Bio-fuels have caught global attention in the last decade. They are renewable liquid fuels made from biological raw materials and have proved to be good substitutes for petroleum in the transportation sector. Being environment friendly, bio-fuels like ethanol and bio-diesel can help us to conform to stricter emission norms. Globally, several policies have given a fillip to bio-fuel production, leading to an increase in ethanol and bio-diesel output. In order to promote bio-fuels in India, a National Policy on Bio-fuels was formulated by the Union Ministry of New and Renewable Energy in 2009. In January 2013, the Union government launched the Ethanol Blended Petrol (EBP) programme, which made it mandatory for oil companies to sell petrol blended with at least 5 per cent of ethanol. The government initiated significant investments in improving storage and blending infrastructure. The National Policy on Bio-fuels had set a target of 20 per cent blending of bio-fuel by 2017. But the ethanol story has not yet succeeded in India. Let us examine why. The EBP was initially launched by oil firms in 2003, with an objective of blending ethanol with petrol. Currently, the programme is being implemented in 21 states and 4 union territories with a target of achieving 5 per cent blending and progressively increasing to 10 per cent blending. According to the Union Ministry of Petroleum and Natural Gas, the approximate ethanol availability in India is 300 crore litres. Of this, about 130 crore litres goes into making liquor, which is non-negotiable for states as liquor is a major revenue source for them. That leaves around 170 crore litres, out of which about 60 to 80 crore litres goes into making chemicals. That leaves about 100 to 120 crore litres for blending. From December 1, 2015 to November 30, 2016, 111 crore litres of ethanol was procured by the Oil Marketing Companies (OMCs) which would be sufficient for blending of only 3.5 per cent. During 2016-17, because of drought in Karnataka and Maharashtra, overall sugarcane and ethanol production reduced considerably and only 66.5 crore litres could be procured from suppliers. According to the Indian Sugar Mills Association (ISMA), sugar mills are set to more than double the supply of ethanol to fuel retailers for blending with gasoline in 2017-18. Ethanol manufactures and OMCs finalised supply contracts for a record 1.4 billion litres during 2017-18 (to realise 4 per cent blending), compared with 665 million litres a year ago. OMCs, however, find it hard to locally procure the sugar by-product at the government-fixed rates as state governments have imposed heavy taxes on ethanol, widely used in the liquor industry. Sugar mills also prefer to sell ethanol to distilleries, where they get a better price and quicker deals. According to Union government rules, 10 per cent of ethanol extracted from sugarcane can be mixed with petrol. However, till now, the government had not been able to achieve the target due to inadequate supply. Reasons for this include the non-uniform distribution of raw material throughout India and the lack of compulsory transportation and storage. Further, regulatory and policy approaches on excise duty, storage and transportation of ethanol and pricing strategy of ethanol compared to crude oil, are yet to be revised and implemented effectively. In India, sugarcane molasses are the major resource for bio-ethanol production and inconsistency of raw material supply is the major cause behind the sluggish response to blending targets. Since sugarcane production is cyclical, ethanol production also varies accordingly and does not assure optimum supply levels needed to meet the demand at any given time. The blending targets are partially successful in the years of surplus sugar production but unfulfilled when it declines. Drastic fluctuation in the pricing of sugar cane farming and sugar milling has resulted in mill owners being hugely indebted to farmers. 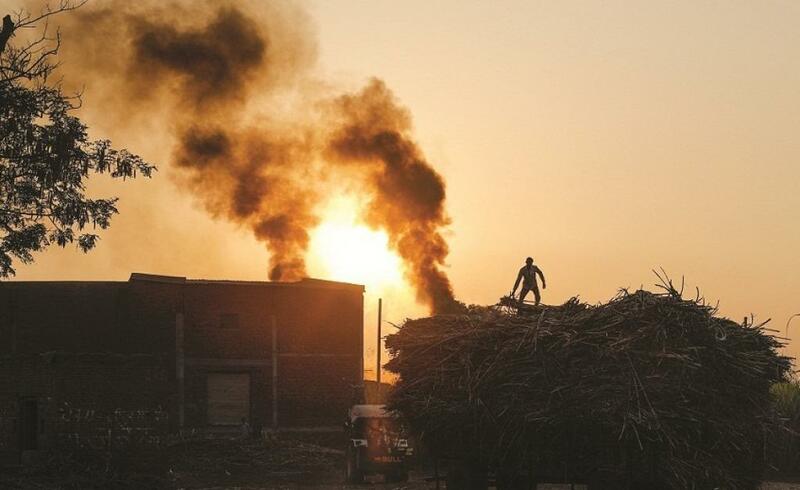 Currently, Uttar Pradesh (UP)’s sugar mills have unpaid cane arrears owing to falling prices and a market glut and are saddled with huge quantities of molasses. It is reported that currently, UP sugar mills have unsold molasses of more than 2.62 million tonnes (MT) which have not been procured by liquor manufacturers. Permission is required for transferring molasses intending to produce ethanol and such applications are pending with the state excise department, which need to be processed urgently. As the domestic sourcing of ethanol is continuously failing to achieve the target, there is a need to look at other alternatives. The National Bio-fuels Policy, 2018, seeks to widen the range of feedstock for ethanol production from the present sugar-molasses to other waste such as rural-urban garbage and cellulosic and lingo-cellulosic biomass, in line with the “waste-to-wealth” concept. The permissible feedstock includes sorghum, sugar-beet, cassava, decaying potatoes, damaged grain including maize, wheat, rice, and most importantly, crop residue such as wheat and rice stubble. This allows farmers to sell their surplus output to ethanol manufacturers when prices slump. The Union government has allowed procurement of ethanol produced from non-food feedstock besides molasses like cellulosic and lingo-cellulosic materials including from the petrochemicals route. In view of the consistent under-supply of domestic ethanol from traditional sources, oil PSUs are establishing 12 2G (Second Generation) Ethanol bio-refineries across 11 states of the country namely, Punjab, Haryana, Uttar Pradesh, Gujarat, Madhya Pradesh, Maharashtra, Karnataka, Odisha, Bihar, Assam and Andhra Pradesh. Media reports say that oil PSUs have entered into MoUs with state governments and technology providers for 2G ethanol bio-refineries. In fact, the foundation stone for one bio-refinery in Bathinda, Punjab has already been laid. The approximate expenditure for raising each bio-refinery is around Rs. 800-1000 crore and it is expected that an amount of Rs. 10,000 crore will be spent by oil PSUs in setting up these 12 bio-refineries. Second generation ethanol is based on bio-mass such as wheat straw, rice straw and crop stubble that can be converted into ethanol. It is more expensive than first-generation ethanol. However, by producing 2G ethanol, India can also address a major environmental issue like crop residue burning which is causing horrific pollution in cities like Delhi. According to the OECD-FAO Agriculture Outlook 2018-27, the demand for bio-fuels is shifting towards developing countries, which are increasingly putting in place policies that favour a domestic bio-fuels market. While declining demand for transport fuel could lead to reduced demand for ethanol in the United States and the European Union —main markets for ethanol—strong growth is expected in Brazil, China, and Thailand, stimulated by favourable policies. In China, demand for ethanol could increase further with the implementation of its proposed new ethanol mandate. According to projections, 84 per cent of the total additional demand for ethanol in the next 10 years will come from developing countries. In many countries, mandatory blending rules impose a minimum share of ethanol and bio-diesel to be used in transport fuel. India, for example, has a target of blending 10 per cent ethanol with petrol by 2022 to cut dependence on imports. To achieve the target, 313 crore litres of ethanol is required. In a slew of decisions, the government has started encouraging sugar mills to divert from sugar and boost ethanol production. Ethanol blending in petrol is an effective way of increasing domestic petrol availability and for that, all -round efforts need to be made to increase the production of ethanol. The technology for cellulosic and lingo-cellulosic bio-mass is still in the evolving stage which needs to be upgraded and refined for commercial operation. There is also the danger of undue exploitation of the liberalised policy by existing sugar-based ethanol units. In the current scenario, the industry may prefer to convert cane juice directly into ethanol without making sugar. Such a move would become an ecological disaster as sugarcane is a cost-intensive crop that consumes a lot of water which the country can ill-afford to grow merely for bio-fuel production. This move needs to be discouraged and closely monitored. Unless the supply of ethanol can be increased from sources other than sugarcane, its use will not be widespread. Recently, the government also proposed blending methanol in petrol as another alternative, but again supply is a problem. A brilliant article. The writer stresses the need to steer away from the water-guzzling sugarcane as the source of ethanol , and focuses on other wastes as the likely source. Excellent & very useful information. It has been done after intense study. In the current year ending on 30th Nov, 2018, the blending is estimated to improve to 4.5%, one of the highest. With the recent decisions to allow Ethanol from B heavy Molasses and alcohol from spoiled grains, the blending percentage is likely to be about 7.5% . It appears India is now progressing well and the New Bio Fuel Policy of 2018 is well planned as it addresses all the concerns and enables solutions to improve EPB. Good Luck!!! It is a brilliant article highlighting the importance of moving away from sugarcane and concentrate on other wastes for Ethanol. But I am little curious to know whether the Government has any policy for generating Ethanol out of animal wastes like cow dung etc. which are available in abundance in villages. The success of any scheme depends on the incentives provided for the generation of the gas either through Govt or PPP models. Going away from Sugar cane for Ethanol is an excellent idea. As pointed by the writer second generation ethanol is based on bio-mass such as wheat straw, rice straw and crop stubble that can be converted into ethanol. Although it is more expensive but it is worth pursuing because it kills two birds in one stroke. It would reduce over dependence on Sugar cane on one side and arrest horrific pollution in cities owing to burning of village wastes. However to implement this effectively we need to be proactive rather than reactive. Suitable incentives are to be provided to farmers to part with the wastes voluntarily instead of imposing laws and bye-laws which may not be effective at all. Suitable infrastructures should be in place in partnership with private firms for smooth collection of wastes. This would also ensure development of economy of Rural India simultaneously.